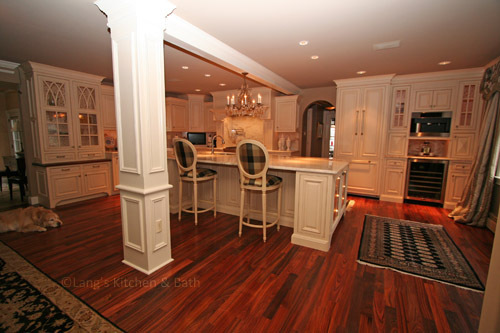 This traditional kitchen design is an elegant room full of personalized features that make it a welcoming space for family and guests alike. The beverage bar includes an under counter wine refrigerator, and the island includes plenty of space for storage, food preparation, and socializing. The furniture hutch, mantle hood, and corner television built into the backsplash are among the personal touches included in this design.